Sally Eccleston was inspired to write a fictional account of Sarah Winnemucca, daughter of a Paiute chief and shaman, after discovering her historically important autobiography in an old mining town bookstore. She was particularly taken by Sarah's fiery spirit, intelligence, and ability to transcend personal tragedy and discrimination to fight for the lives of her people. The author's interest in American Indian religion was sparked while taking postgraduate classes on world religions and creative writing at San Francisco State University. Her creation of an endearing, aged, modern-day shaman teaching at a university, and tending to her students' dire problems, stemmed from her early years of college in Nevada. The similar supernatural abilities of shamans throughout the world were particularly fascinating to the author, as she explored the concepts of extrasensory perception, past lives, and multidimensional realities. While researching the book, she became increasingly reverent to the earth's natural environment, necessary for sustaining life on earth for future generations. The author has been writing for over 25 years, setting many of her stories in the beautiful Sierras and desert basin of Nevada, with its colorful mining history. She is presently at work on a fictional novel loosely based on the diaries of her great-grandparents, who came from Scotland and settled in Virginia City, Nevada during the Silver Rush. She works as a Sr. Editor at University of California. In Leap Beyond Blue Sky Veil, Sally Eccleston has created a highly readable, enjoyable novel that weaves the true story of an 1865 massacre of twenty-three Paiutes, mostly women and children, by a misled U.S. Cavalry with the modern day tale of an aged university professor, descended from those Paiutes, who befriends and ultimately saves the lives of three of her students. Those students, Kitt, Roycee, and Marian are certainly modern day girls; but they also seem to be reincarnations of sisters Elma, Mary, and lone survivor, Sarah, who were members of that group of Paiute women attacked so savagely long ago. 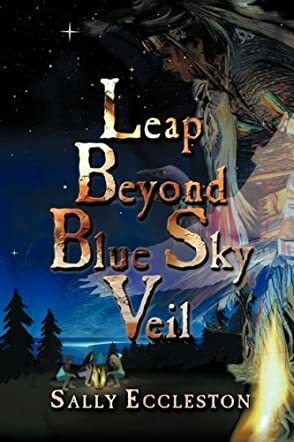 Leap Beyond Blue Sky Veil is well edited and well crafted. It will appeal to many different types of readers as it has an interwoven story line of many depths. Author Eccleston has created totally believable major and minor characters. Edwina, the university professor, is enchanting and believable as a shaman; and Kitt and her father, Police Chief Frank MacAdamir, come across to the reader as well-created, "warts" and all. Even the bad guy, Walter, is well delineated. Leap Beyond Blue Sky Veil is a good, solid purchase for libraries and readers in general. It will have lasting value as a book years from now. From the start "Leap Beyond Blue Sky Veil" had me drawn into this emotionally compelling tragedy of an innocent Paiute Family who are massacred by the US army in the late 1800s at Pyramid Lake. My love for the Native American lore and their love of spirit had me enthralled at every turn. Sarah Winnemucca, one very strong child, comes out of this to leave her legacy throughout the area as she will be known for her great powers and shamaness abilities that will transcend through the ages. As for the area in Nevada surrounding this lake, each supernatural event is imbued with clues that twist and turn, leading to some future connection with modern day characters who have inherited a mystic bond between all of them. Each scene is painted with vivid vocabulary that can transport you back to the days of the attacks and the modern day settings. I found myself deep with inquisitive thoughts as I could tie all the clues of the past events of pillage, lust and greed into its modern day oddities of the area. As the story is retold by the aunt of Sarah Winnemucca three very unique college girls will bond in a very strange way that will let you know that they each has an unfinished mission to follow and you will find out in the end just how strong this mission is. Sally Eccleston writes with such passion for this tale as is apparent in her poignant words. She writes with such a strong voice for the cultures of the Native American world and her words echo throughout the book with hints of sacred messages that we have all been hearing lately from our forefathers at a time when our earth is making way for change. The book's message will leave a lasting imprint on your soul. Sarah was merely eighteen when she witnessed the massacre of her sisters, her little brother and her tribe. She and her siblings were doing laundry when the troops arrived, led by Captain Wells. While the Indians were called savages, it was the U.S. Army that gathered the babies and threw them on the fire. The year was 1865; life for Sarah would never be the same. She worked for the US Army as an interpreter, married a white man and became an advocate for her people. The sight of the massacre was burned into her mind and could never be forgotten. The members of Sarah’s family had the gift of extra sensory perception. She had warned her father the morning of the attack that something wasn’t right. "Leap Beyond Blue Sky Veil" by Sally Eccleston is a fascinating read. This fictional tale is based on Sarah Winnemucca’s autobiography. She was a remarkable woman who became a spokesperson for the Paiutes. She captures the culture of the Numa people. Eccleston’s description of Captain Well’s attack on the Numa saddened me. If there was ever a discriminated people it was the Native Americans. Eccleston doesn’t stop there. She continues by creating a fictional character in Edwina Winnemucca. Edwina lectures to her class on Sarah’s story. As this tale progresses the author further develops the theme of powers that have been passed from Sarah’s family through the bloodlines to Edwina and her three friends. Prophecy is fulfilled in the reincarnation of the sisters as predicted by Shaman, Edwina’s father. There is much more to this book than I could begin to share. I hope this book gets the attention it deserves. Sally Eccleston, the author of "Leap Beyond Blue Sky Veil" has written a book that deals with mystical qualities that are inherited from an ancestor. She begins her book by retelling the true story of Sarah Winnemucca. Sarah and her sisters were washing clothes when Captain Wells of the U.S. Army attacked the 23 natives and brutally killed each one. Sarah managed to escape death but the smell of blood and the nightmare of watching her people die haunted her. Her father the Chief and Shaman survived but was never the same. Sarah’s story continues with her life working with the army and married to a white man. Her heart was for her people and she fought for the rights of her people. I wish the author had stayed with this story. She did an excellent job of detailing Sarah’s life. The rest of the story centers on Edwina Winnemucca and some of her students. Edwina used the life of Sarah for her class. She singled out three students that became friends and possibly reincarnation of Sarah’s siblings. Edwin’s father was a Shaman and predicted that Sarah and her sisters would be reincarnated. Edwina had a strong psychic power and saw visions of her friends in trouble. I would much rather this had been a second book. Both parts of the story is well done. I can see a series rather than one book. I was consumed by the story of Sarah. The author made the story come alive. However, there is more than a little repetition in the text. This is the first book I’ve read by Sally Eccleston. I believe she has great potential and is a name we will hear again.